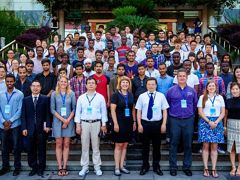 Stacy Hutchinson, professor of biological and agricultural engineering, and Shawn Hutchinson, associate professor of geography, recently presented research emphasizing surface water resource quantity and quality on June 6 at Jilin University in Changchun and on June 8 at an international workshop for water resource utilization and management organized by China Three Gorges University in Yichang. The Hutchinsons were accompanied in China by students Kari Bigham, Topeka; and Kelsey McDonough, Jamestown, Rhode Island. Both are doctoral students in the department of biological and agricultural engineering. Research presentations included "Water SECURE: Water Sustainability and Environmental Conservation Utilizing Research and Engineering" by Stacy Hutchinson; "Monitoring Grassland Vegetation Condition and Trends using Moderate Resolution Satellite Image Time Series" by Shawn Hutchinson; "To Restore or Not: The Future of Degraded, Warm-Water Streams in Agricultural Landscapes in the United States" by Bigham; and "Urban Land Management Strategies for the Provision of Ecosystem Services" by McDonough. The research tour of Chinese universities was conducted as part of an effort to organize a future study abroad experience in China focused on water resources where K-State and Chinese students would study hydrology and geospatial technologies in both the classroom and the field.